One of my goals this week was to try something new. Believe me, there are a lot of things on my list, but the best thing to do is just go with what your heart feels, and this is what came. I’m not sure if I even like the outcome, but what a THRILL came from trying something new!! It’s how we learn. It’s how we grow. How are we going to know if we don’t try? And if it doesn’t turn out, well, learn from that! This afternoon a friend loaned me a book to read, “The Four Agreements” by Don Miguel Ruiz. (Something else new!) It is an amazing book..definite recommend. As I was reading, one part in particular made me think of the creation I made today: Ruiz speaks of self-rejection, self-abuse and self-judgment and how although we may at times blame others we are indeed our own worst critics. He speaks of how we have our own perception of what is ‘perfect’ and we are constantly striving for it. 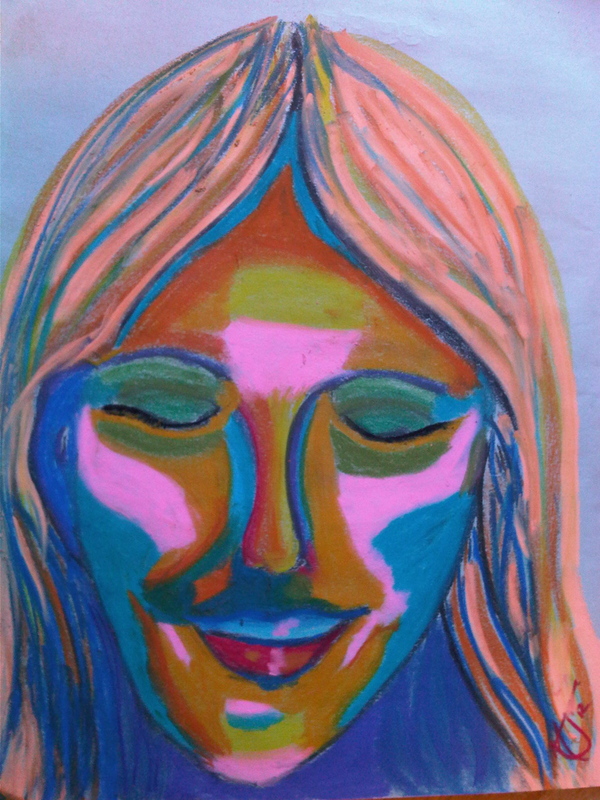 Thinking back to an hour or so before when I had started to play with the pastels, I realized how terrified I had been to try this new creative exploration-despite the fact that I really had no intention of showing it to anybody! No, I was completely judging myself before I even began. In other words, I was letting Fear (False Evidence Appearing Real) be my leader. The good news is I have conquered fear before, so I was able to summon up the courage to conquer it again. But guess what my first thought was when it was done? NOT GOOD ENOUGH. Definitely not PERFECT!! Yikes! Talk about self-rejection! Regardless of how I feel about this image (or how anyone else feels about it!) I am proud of myself for taking a risk, which I know will ultimately lead to growth.